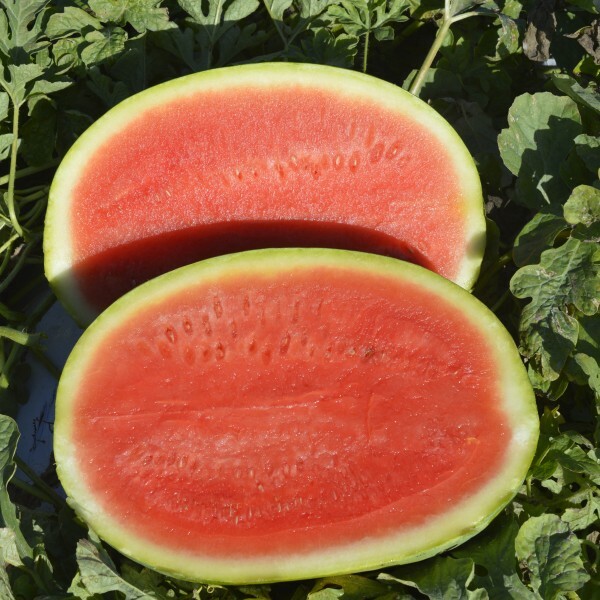 SV0241WA is a 60/45 count watermelon hybrid with excellent interior quality. An oblong triploid, SV0241WA also has a beautiful rind that is light green with medium green stripes. The fruit are very uniform, with small pips, a vibrant red flesh color, and exceptional firmness and sweet taste. Key to Disease Resistance Co = Anthracnose Fon = Fusarium wilt HR = High Resistance - The ability of a plant variety to highly restrict the activities of a specific pathogen or insect pest and/or to restrict the symptoms and signs of a disease, when compared to susceptible varieties. Varieties with a high resistance may exhibit some symptoms when specified pathogen or pest pressure is severe. New and/or atypical strains of the specific pathogen or pest may overcome the resistance. IR = Intermediate Resistance - The ability of a plant variety to restrict the growth and development of the specified pest or pathogen, but may exhibit greater range of symptoms compared to varieties with high resistance. Intermediate Resistant plant varieties will show less severe symptoms or damage than susceptible plant varieties when grown under similar environmental conditions and/or pest or pathogen pressure.